Thank you for supporting the CSA! click here to Donate to the CSA! 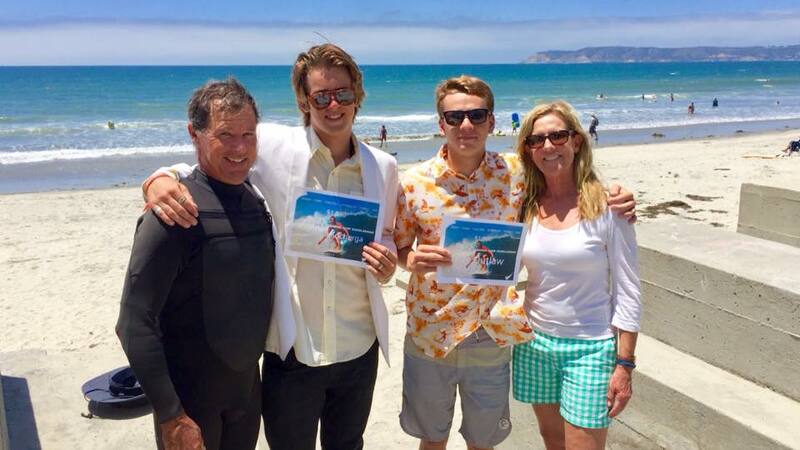 in 2017, the Coronado Surfing Association donated $17,000 to the Adenoid Cystic Carcinoma Research Foundation in memory of Lorton Mitchell through the Lorton Mitchell Surf Fest. The CSA is an important way to connect with the Coronado surfing community and be a part of organized surfing culture in Coronado. In addition to our annual surf event, "the Lorton," the CSA is actively working to promote safe and clean beaches in our community. As a non-profit organization (501c3), the CSA actively raises funds to support the Surfing Scholars program to provide scholarships to deserving graduating seniors at Coronado High School. Pictured: 2017 CSA Surfing Scholar Award recipients Ben Outlaw and Kristian Kocherga, along with CMS and CHS Coach Stan Searfus and CSA board member Carolyn Mitchell. The CSA also helps the development of future generation of surfers in Coronado through its support of the Coronado Middle and High School surf teams. As a member of the Coalition of Surfing Clubs, the CSA actively participates in surf events throughout the state as its members surf and represent Coronado.